Am I being bias by starting with how much I hate this App? Probably so since it seems like so many people really do like and use it. I just don’t know who the heck they are to be quite honest! 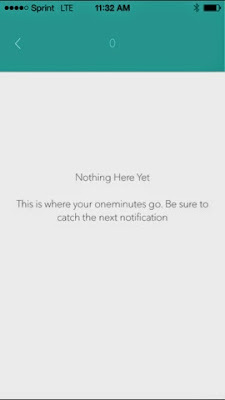 OneMinute send you a random notification and then you have 60 seconds to take a photo from wherever you are and whatever you are doing. Sounds like fun until you keep missing the notification because your phone is your purse or pocket, you are in an important meeting, working out or walking your dog. Days, weeks and maybe months go by before you actually get a moment to snap a photo within the given timeframe of the OneMinute App which is 60 seconds. There is no ignoring the notification for a more opportune photo. You just have to roll with it. How many notifications can I possibly miss? What happens after you take a shot for OneMinute? Honestly I wouldn’t know because I could never catch the damn thing but according to other people who seem to have great time precision or just stare at their phones all day; the OneMinute App gathers everyone’s photos, creating a photo thread of sorts for anyone who has the app to view - whether you contributed or not (which is where I fall in, of course). 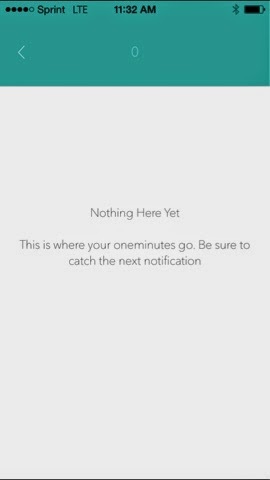 Since I missed every notification and I won’t tell you how long I’ve had the App installed in my phone (don’t “#appshame” me); I scrolled through the feed to see what other people where doing when they got the notification. I must say there is some interesting stuff happening around the world. The ‘one minute’ spontaneous photo race allows for no pre-planning, arranging of things or editing. 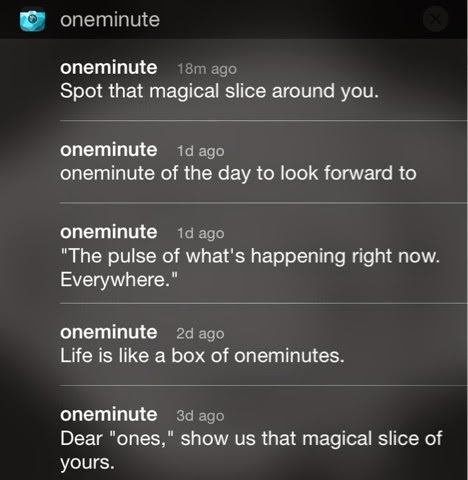 In addition, OneMinute only captures a narrow landscape-ish snippet of the world around you. In the end there was nothing left to see! 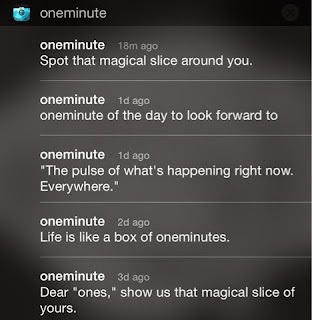 OneMinute can be a fun escape from your day to day world if you are tired of what is around you. It is also a great way to help time pass while waiting in line but I’ve opted to delete it from my iPhone. The OneMinute App is free and is available for ISO and Android. I’ve included links to the site and their Instagram is pretty cool!